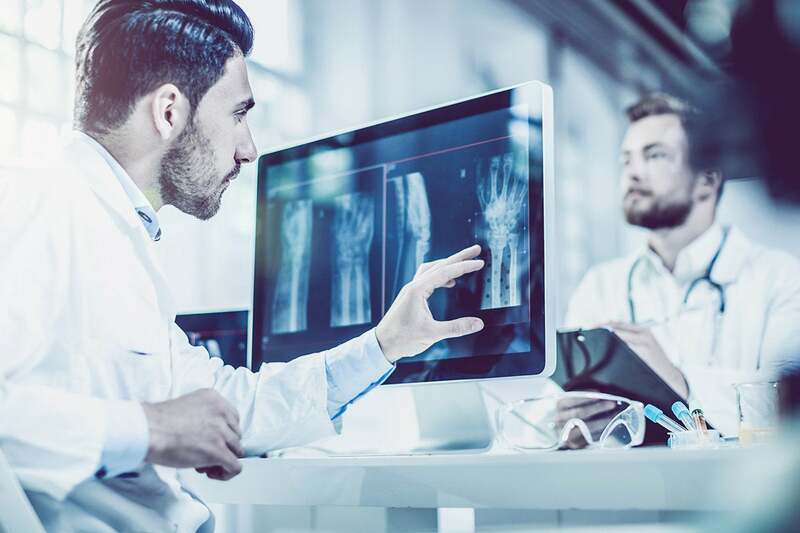 Accenture’s whitepaper, Artificial Intelligence: Healthcare’s New Nervous System, lists the top 10 AI applications in healthcare, and estimated their near-term values in terms of annual benefits. The top 3 are robot-assisted surgery ($40B), virtual nursing assistants ($20B) and administrative workflow assistance ($18B). While pondering whether those broad categories should be the areas of your focus, or to increase investments in them, it may be beneficial to take a look at what others are doing. One community hospital, for instance, used unsupervised machine learning and supervised prediction to reveal optimal care pathways for pneumonia by identifying the commonalities between those with the best outcomes among thousands of patient records. The effort started with using SQL code to pull data from multiple hospital systems (AllScripts EHR, enterprise data warehouse, surgical, financial and corporate performance), and FHIR to deliver the results into the clinical variation management application. With the help of an intuitive interface that reveals insights (e.g. the reason, and timing, for a recommended pathway step), the project garnered sufficient support to deploy the optimal care pathway by revising the ED and inpatient order sets in the EHR. This initial work on pneumonia care pathway saved $850,000 in unnecessary costs. Now sepsis, heart failure, total hip replacement and COPD are among others on the horizon. Montefiore Health System took a more fundamental approach: developing a data lake, and graph-database based infrastructure that may support a variety of patient-care use cases. It has enabled them to implement advanced sepsis detection tools, and also tools to support clinical decision making at the point of care. The investment in data management pays off well: their data scientists now spend 70% of time doing AI analytics vs. 75% in data management and data wrangling previously. The resulting infrastructure, Patient-centered Analytical Learning Machine (PALM), becomes the foundation that brings economies of scale to AI analytics projects. Beside supports in the organizations, common to both projects is data integration. AI starts with data, and data management (via data governance, cleansing, ETL, semantic harmonization and others) efforts provide the foundation on which AI algorithms can source semantically harmonized data, build models, make predictions and refine models. It is also necessary to bring the results to the healthcare workflows – e.g. revising order sets, or injecting insights into point-of-care system – to realize the benefits. Once you have data management down, plenty of opportunities exist for AI as tools to support innovations that will bring much ROI to the organization. For example, a combination of Natural Language Processing and Artificial Neural Network can easily surface misses in insurance verification and/or preauthorization so the care team can get them straightened out prior to an encounter for a procedure. With that, the initial focus is back to data-driven initiatives, and providing the insights – be it from AI, BI (business intelligence, like OLAP and data visualization tools) or humans (e.g., case management) – to the frontline workers in order to guide decision making and/or automate work, without which the AI investments will have limited impacts. Gartner called this “augmented analytics” in its Gartner Top 10 Strategic Technology Trends for 2019 Smarter with Gartner article. “Augmented analytics represents a third major wave for data and analytics capabilities as data scientists use automated algorithms to explore more hypotheses. Data science and machine learning platforms have transformed how businesses generate analytics insight,” according to David Cearley, vice president and Gartner Fellow. Kai-Fu Lee, an AI expert, venture capitalist and the author of “AI Superpowers: China, Silicon Valley and the New World Order,” portrayed a very broad-based, cross-industry, cross-geography view of AI’s impacts. A point Lee put forth to argue the China advantage is that good, widely adopted products generate a detailed treasure trove of data, which in turns allows companies to perform sophisticated AI to produce better and more widely adopted products. The virtuous cycle continues, and the industry leaders that do this well will keep widening their leads over others, resulting in winner-take-all economics. Then the minimum winning AI strategy is managing data to enable AI explorations. The work product of the strategy may facilitate many projects that use data to lead to better services, implement better services to bring more patients and start the virtuous cycle. A hands-on leader in web, data and healthcare IT, Cheong has a track record that includes Web patents licensed to leading firm such as Microsoft and Adobe, and building and operating enterprise systems in healthcare, financial and internet industries. He most recently brought a team together to bridge the gap between AI and the frontline workers with a SaaS system that enables smart collaborations, and continuous learning toward organizational goals.